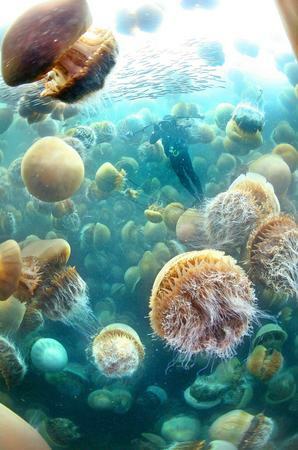 This crazy photo from the Yomiuri Shimbun shows a diver swimming amongst a swarm of giant jellyfish. These giant sea blobs, known as Echizen kurage (Nomura's jellyfish), inflict heavy damage on Japanese fisheries in the Sea of Japan each year. This year's invasion appears to be in full swing. The number of jellyfish has risen dramatically off the coast of Maizuru in Kyoto prefecture since Typhoon No. 13 passed over the Sea of Japan in mid-September. Thousands of the giant jellyfish, which can grow up to 2 meters (6 ft 7 in) in diameter and weigh up to 200 kg (440 lb), become caught in fixed fishing nets each year. ARE YOU GUYS STUPID??!! Jellyfish are venemouse creature that easily kill humans.They are multiplying due to rising water temperatures.Venemous jellies live in hot places.They like hot water so they multiply.If they feel threatened they release all their sperm/eggs into the water so they keep increasing.If you would like more info go on youtube and look up "Jellyfish invasion".You might see it on discovery channel sometimes. Neatorama » Blog Archive » Giant Jellyfish Attack Japan (Again).